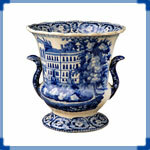 A large and impressive punch bowl, an item not often seen in this pattern. Sometimes it is difficult to tell, on these rounded pieces, what version of the scene is depicted. This punch bowl abbreviates the bottom portion of the scene where the man with a wheelbarrow would appear. 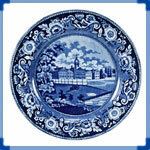 But because of the trees on either side of the scene, it is probably version #1 of the Rogers' Boston Sate House view. The motifs found in the #1 version of the pattern do not appear in the view on this side of the bowl; however, they may be on the other side. (See the chamber pot and spittoon photos in this exhibition.) The features on hollowware items are not necessarily arranged in the same order in which they are found on a platter or other flat ware piece. Note: All of the images in shapes showing Boston State House are probably of the #1 variety. To see the other 2 varieties, see Patterns, Boston State House #2 and #3.